Would it be weird if I told you that my favorite Star Wars characters are just extras? Jedis are cool and all with their force wielding stuff not to mention lightsabers. I actually like Jawas better (insert weird looks here). Maybe I just like the unpopular guys better, just look at that hood and glowing yellow eyes. I know they're supposed to stink but this talking plush is guaranteed to smell good or not even have an odor of any kind. Did I mention these guys talk? 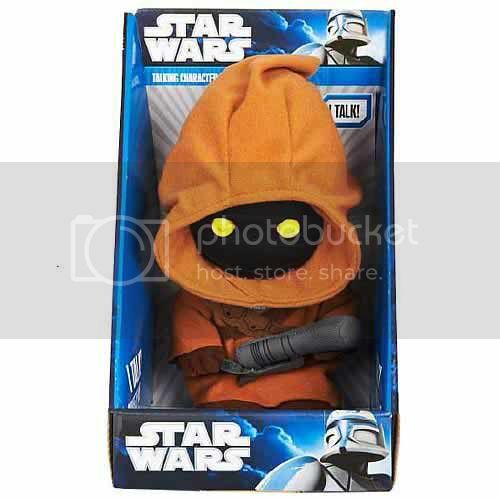 I mean the plushie and not the actual character, far as I remember I can't even make out anything they said in the Star Wars films. If you have USD 21.00 hanging around you might want to pre-order one of these just so you can complete your whole plushie collection. They talk, its just in their own language. Also do u have a link to order on of these that I'm just not seeing?